Michigan homeless man got his luck when he found out that he won $50,000 worth of lotto prize. But even he got the money, he decide to keep his living under the tent together with his friends in the homeless community, according to report by The Examiner site. Homeless man name is Mahurin, he said, "with all the other homeless people around here, I've made up my mind. I'm gonna give them each $100." He purchased the lotto ticket at the local gas station in Michigan. According to Sandra Rankin, employee at the gas station, "He is a great guy, has an awesome sense of humor. I care deeply for him and he is a very decent gentleman. He comes into my store three to four times a day." But some people think that Mahurin is making a huge mistake. As he decided to keep being homeless and live under the tent. For the meantime, If you like this news, please bookmark it now or visit this site more often for you to be updated. You may also share this post to your friends so they may know about the Homeless man wins $50,000 of lotto prize. 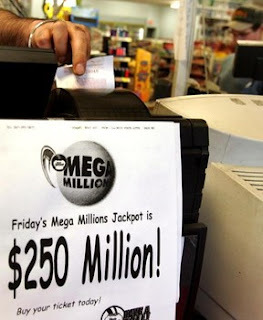 Comments or suggestions about "Homeless man wins $50,000 of lotto prize" is important to us, you may share it by using the comment box below.